JOHN PHILIP SOUSA Autograph Signature. American composer and musician. Known as "the March King". Composer of 'The Liberty Bell', 'Stars and Stripes Forever', 'The Washington Post', etc. Autograph presentation signature on card. 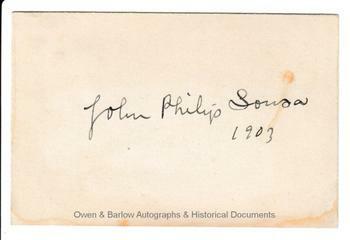 Signed "John Philip Sousa 1903". 9 x 6 cms (3.75 x 2.5 inches). On white card. Very light mounting traces to verso. Fine.